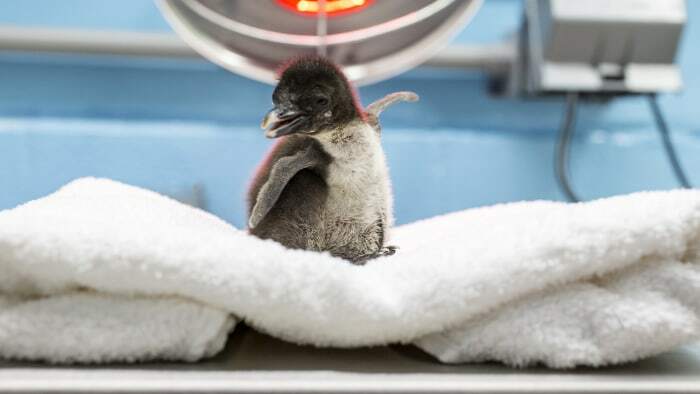 Chicago’s Shedd Aquarium just introduced the world to its newest baby penguin, a teeny-tiny rockhopper penguin that weighed just two ounces when it emerged from its egg on June 9 – just slightly more than the weight of a golf ball. Rockhopper penguins are one of the smallest types of penguins in the world and the littlest one that the aquarium houses. The aquarium, which specializes in animal rescues and rehabilitation, is currently home to 13 rockhoppers. The adorable chick hasn’t been named yet – for now its known as Chick #23. They still don’t know its gender, because there are no observable traits to distinguish a difference between male and female penguins. After a year, they can perform a genetic test to reveal its gender and give it a name. 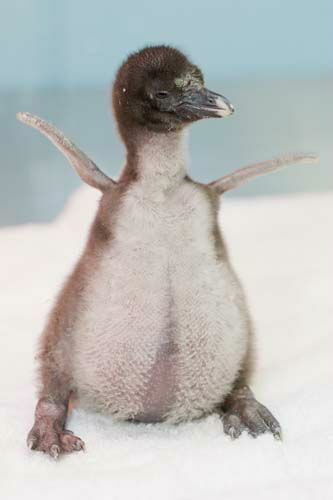 The aquarium says that the tiny penguin is already trying to groom its soft, down-like plumage, which is a big milestone for the little bird. They also note that both parents, Edward and Annie, are quite attentive, and are sharing feedings duties, with a little help from the aquarium penguin experts.